Chennai (formerly Madras) is the capital of the South Indian state of Tamil Nadu. It is the gateway to the varied culture of south India. The fishery towns that were situated here along the Coromandel coast grew together during the British colonial times, forming the major city of Chennai. Now Chennai is the cultural and commercial capital of southern India and fourth biggest metropolitan area of India. Chennai is a modern city with beautiful buildings and a lot of green areas. In the 17th century two merchants (Francis Day and Andrew Cogan) of the East India Company established a trading post between the with palmtrees surrounded rice fields and fishery towns. The fortified settlement was finished in 1640 and was called Fort saint George. Outside the walls of the fort was situated George town, the "indigenous" town, where the British stored their goods. Every street in George town was devoted to another handicraft. Under British rule the villages in the surroundings grew together. One of these villages was the 16th century Portugese settlement of San Thome, the sacred location where apostle Thomas would have stayed (and from where Christianity in India was spread). Long before the arrival of the Europeans, in the 7th century, the Pallavas (an ancient Tamil kingdom) built a seaport at Mylapore. The Kapeleshvara temple shows the old age of the city, as well as the Parthasarathi temple in Triplicane. With the colonial time started the commercial advance of the city. Nowadays most trade buildings and enterprices are established in George Town. Fort Saint George is the location where the government of Tamil Nadu is seated. The area of Chennai is 172 square kilometres, where the old and the new, the stately colonial buildings and the modern skyscrapers form a dynamic picture. The rich cultural heritage of Tamil literature, music, and dance finds a continuation at the universities and cultural stages. 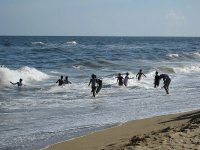 Chennai has a tropical climate with hot and humid weather year-round. The average maximum temperature ranges from around 28 °C in December to 37 °C in June. Average lows range from around 20 °C in January to 28 °C in May. Average annual precipitation is almost 1,300 mm with half of that falling in the months of October and November alone! January to April is fairly dry and the best time for a visit. Chennai International Airport (MAA), located at Tirusulam is around 8 kilometres south of the city centre. The airport has both domestc and international terminals. Domestic flights are available to almost all the big cities in India. International flights are avialable to many cities around Asia and Europe, which include Frankfurt, London, Paris, Kuala Lumpur, Dubai, Muscat, Singapore and Colombo, amongst others. Airlines to/from the Middle East such as Etihad and Oman Air also fly to Chennai from Abu Dhabi and Muscat respectively. The airport is situated on the busy Grand Southern Trunk Road (National Highway 45) and is also served by the Airport station (Tirusulam) on the Suburban railway network. The proposed Metro Rail System (Chennai Metro) will also connect the Airport with other important places in Chennai. Chennai is an important railway station on the southern railway network. It is well connected to all the major cities of India by express trains, including those to Delhi, Mumbai, Kolkata, Chennai and Hyderabad. The city has two main railway stations: Chennai Central, used mostly by the long distance inter-state trains, and Chennai Egmore for regional trains. For more details about timings, fare and availability of seats have a look at the Indian Railways official website. The Chennai Mofussil Bus Terminus (CMBT), the terminus for all intercity buses from Chennai, is the largest bus station in Asia and has buses throughout Tamil Nadu and further afield in India. Chennai has a port, but the only relevant connection is the long trip to the Andaman and Nicobar Islands. Chennai has about 71,000 auto rickshaws. The fares of Chennai auto-rickshaws have been an enormous political topic for many years and has contributed to the perception that the city's auto rickshaw drivers never use meters and continually fleece passengers. However, despite the reputation, trips by auto rickshaw actually are quick, cheap and quite often based on the metered price. The Chennai Suburban Railway provides rail services in the wider Chennai area. The suburban trains are generally reliable and fast. The frequency of suburban trains is generally good and it is advisable to take a first class ticket during peak hours. Trains offer a reliable alternative to quickly reach your destination when compared to buses which might get trapped in traffic jams. The fare in Chennai suburban trains is the lowest in the country and you don't have to compromise comfort for the meagre amount that you pay as in other Indian metros. There is a separate ladies compartment in the suburban trains that are relatively less crowded even in peak hours. The Metropolitan Transport Corporation provides bus services throughout the city. MTC Chennai operates AC bus service between important routes like Parrys - Tambaram, Parrys - CMBT, Chennai Central - CMBT, Chennai central - Tambaram, etc. Most frequent AC bus runs between CMBT towards Pondicherry and are known as East coast road (ECR) buses and is very popular for intracity travel too. Government run liquor stores called TASMAC are all over the place but in general not at all a pleasant experience. They usually have rude staff, are filthy and usually never have the brand of your choice. Also they always tend to mark up each bottle by ₹5-10 over the listed price. Go for it if you want a one time war like experience in order to obtain some booze! Nightclubs close at 23:00, even on Fridays and Saturdays, according to government rule. There are many budget hotels near the Egmore train station, especially around Kennet Lane and Triplicane. Hotel Regent - 11 Kennet Lane. About 350 rupees for a double room. Tel: +91-(0)44-28253347. Broadlands Lodge - 18 Vallabha Agraharam Street. About 450 rupees for a doubleroom. Tel: +91-(0)44-28545573. We have a comprehensive list of accommodation in Chennai searchable right here on Travellerspoint. You can use our map to quickly compare budget, mid-range or top of the range accommodation in Chennai and areas nearby. This is version 37. Last edited at 15:38 on Nov 20, 17 by Utrecht. 44 articles link to this page.